It’s Tuesday, it’s quiet in my house, and my computer is charged. I couldn’t ask for more inspiration today, but I don’t know what to write. Still, I write. Because it’s Tuesday, it’s quiet in the house, and my computer is charged. I’m celebrating with Ruth Ayres today! One day the preschool boy who loves science will absolutely perfect the vegan oatmeal raisin cookie. He will make these while you write (ok, and fall asleep) on the couch, before he makes chocolate chip cookies with his younger brother. You will still have many messes to clean up in the kitchen, but everyone knows that oatmeal raisin cookies make cleaning up easier. There was at least one Sunday where you fell asleep on the couch. Your 11 year old made you vegan cookies, and the dog slept next to you. You decided not to care about the shoes all over, and the dirty dishes that multiply by the minute. Your 8 year old watched Pokemon, and you reminded yourself that it was Sunday (translation: chill out). There might have been glitter on the kitchen floor, slime supplies piled on the counter and a cone on the dog’s head. . . but there were also cookies, a puppy, and naps. 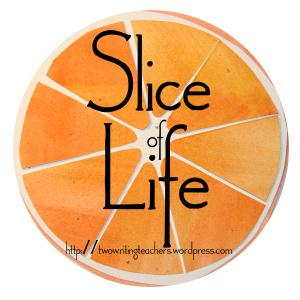 Slice of Life Cup of Sunshine, Cup of Joy. I step out of my car to get my bags, and realize I need to zip my raincoat. So, I put my coffee cup down on the booster seat. I zip up, grab my bags and start walking into school. I turn back to my car as soon as I realize that I’ve left my coffee, and I know before I get there that it must have fallen and spilled. Not only did it fall and spill, it actually emptied. I bring the cup into school anyway, so that I can make tea, and I think about how happy I am that this rainy bad morning is a Tuesday. “At least I have a slice,” I think. I look down at my cup and see that I have actually spilled my cup of sunshine on a rainy day. How poetic. Later my allergies will still be acting up, and I’ll notice a rip in my scarf. I’ll wonder if I should write an “Unfortunately/fortunately” poem, and then quickly realize that form needs some “fortunately” to balance it out. No pressure on this cup of tea, or the people I work with this afternoon, but I’m banking on them being that balance.